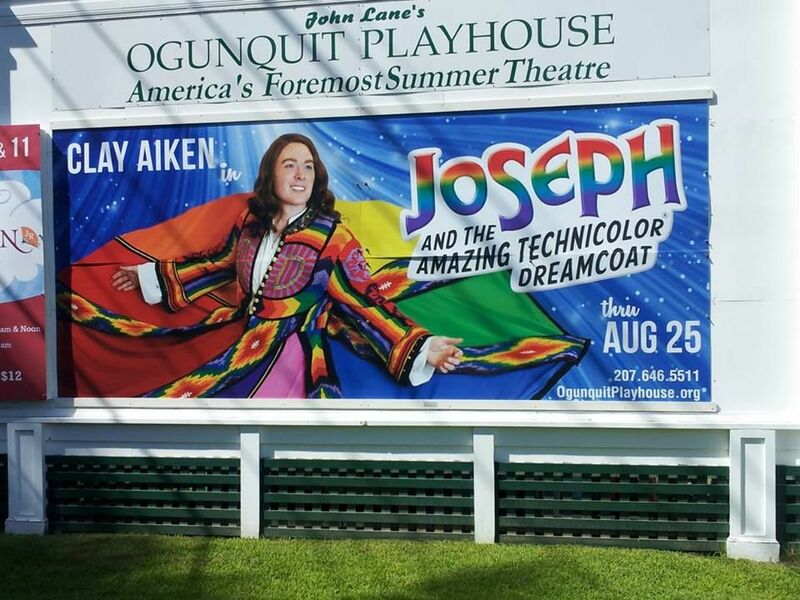 There are a few new articles about Clay Aiken and his role as Joseph at the Ogunquit Playhouse. Joseph and the Amazing Technicolor Dreamcoat at the Ogunquit Playhouse adds more than just a classy night out to this summer’s offerings on the Maine coast. It’s simply a lot of fun. Joseph is played by Clay Aiken of American Idol fame among other accomplishments. Broadway’s Keala Settle is the Narrator. Their big talents combine with an energetic cast of professional actors and local children in a musical romp through the classic biblical tale of Joseph and his jealous brothers. …The Ogunquit performance lived up to their talented vision and then some. If the costumes and dance numbers don’t make you wish intermission did not arrive so soon, you’ve spent too much time on the beach that day…. And then there is the short article at People. Clay Aiken is letting his colors show. The former American Idol finalist, 34, could be mistaken for a walking rainbow in a photo released by the Ogunquit Playhouse, a local theater in Maine. The vibrant shot promotes Aiken’s lead role in Andrew Lloyd Webber’sJoseph and the Amazing Technicolor Dreamcoat musical. With wavy hair past his shoulders, a wide-eyed Aiken flashes a grin in the image. It is almost time for the evening performance of Joseph and The Amazing Technicolor Dreamcoat. If we get any reviews, pictures, or videos, I will post them later tonight. Please check back! Thank you for the links. It's so important we all show support for Clay!. Error: Error validating access token: Session has expired on Tuesday, 21-Aug-18 16:13:01 PDT. The current time is Thursday, 25-Apr-19 17:20:32 PDT.